Involved in white cell antioxidant activity, cardiac contractility, sperm motility, development and function of the nervous system. Used for improving physical and mental performance. This taurine supplement is particularly valued by those seeking to improve their physical and mental performance. As indicated by its chemical denomination, 2-aminoethanesulfonic acid, taurine is an amino acid derivative. Its name comes from the Latin taurus meaning ‘bull’, as it was first discovered in the bile of this animal. It is, however, found in many other animal species including humans where it can be synthesised from two sulphur-containing amino acids called methionine and cysteine. In the human body, taurine plays a part in numerous metabolic processes and has now been made available as a dietary supplement precisely to support this important activity. Taurine is present at significant levels in the brain and muscles where it plays an important role in a number of biological processes. In cardiac muscle it is primarily involved in cardiac contractility. It is also involved in growth processes and is essential for the maturation of the nervous system. In general terms, it helps protect vital functions and as such, may be involved in the antioxidant activity of white blood cells, fighting cell damage. In addition to these protective effects, it may also be involved in processes such as the digestion of fats and sperm motility. Suffice to say then that taurine’s potential in the body is considerable. improving physical and mental performance. 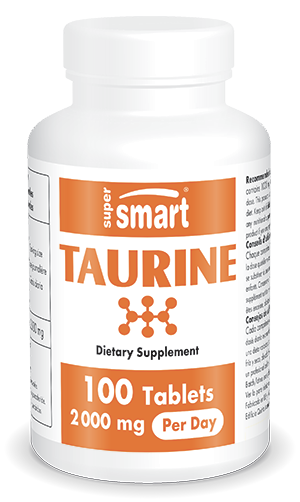 It is possible to benefit from taurine’s powerful activity as this amino acid derivative is now available as a supplement from the SuperSmart catalogue. For optimal efficacy, each capsule contains 100mg of taurine with a suggested dose of one to two capsules a day, although this dosage can be adapted to individual need. Like taurine, creatine is another substance popular with sportspeople who take it to improve their physical performance and help gain muscle mass. To promote synthesis of natural creatine in the body, arginine supplements are a good c, such as the product Arginine Alpha Ketoglutarate and the precursor L-Citrulline. Note: Given this substance’s powerful effects, those with heart problems should not take taurine supplements. If in doubt, seek medical advice. Other ingredients: microcrystalline cellulose, fructo-oligosaccharide, magnesium stearate, silicon dioxide. Each tablet contains 1,000 mg of taurine. Take 1 or 2 tablets per day.